“In Thailand, and here at our Oak Bluffs restaurant, eating is family,” Jirawadee Hazelton, a server at Bangkok Cuisine says one recent afternoon, where she is sitting with Anurak Somboon, the head chef of the Island’s only Thai restaurant. 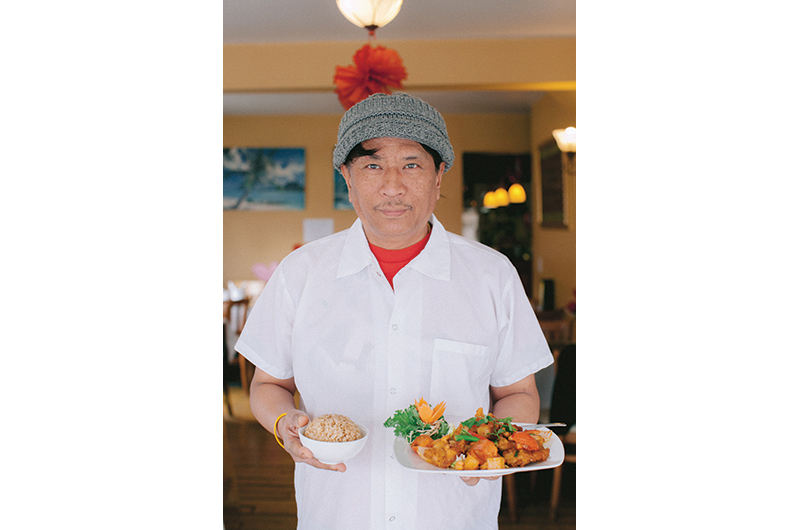 Somboon doesn’t speak much English, so Hazelton is translating, but he smiles when he hears the word kin, and he points to his staff around him, rather than the food on plates nearby. “We are all from Thailand,” Hazelton says. And the proof is in the food. Chicken himmapan, a permanent special on the menu at Bangkok Cuisine, is the dish Somboon makes most often. Cashews, the star of the dish (himmapan loosely translates to cashew), are what Somboon say remind him of authentic Thai cuisine, as they are a big crop in Thailand. Even when sautéed on their own, cashews can give any Thai dish the illusion of a buttery bite without ever using butter. To make the signature special, Somboon takes very thin chicken cutlets and lightly batters them with flour before dropping them in the deep fryer to create super slim, extra crispy pieces of chicken. Then, using a saucepan, he cooks the dressing by sautéing sweet pineapple, tangy tomatoes, onions, scallions, bell peppers, and cashews. Somboon suggests ordering it with a side of brown rice or rice noodles, although it’s also good on its own. Chicken himmapan is a sharing dish, which Somboon says is the main concept behind dining at Bangkok Cuisine.